- Net income of $15.8 million, or fully diluted EPS of $0.54 for the fourth quarter, representing an increase of 268.3% and 285.7%, respectively, from the year-ago quarter. - Net income of $59.5 million, or fully diluted EPS of $2.01 for the year, representing an increase of 44.4% and 50.0%, respectively, from last year. - ROA of 1.10% and ROE of 12.90% for the fourth quarter. ROA of 1.05% and ROE of 12.22% for the year. - Total loans increased by $100.3 million in the fourth quarter, or 2.5% sequentially and 8.2% year-over-year. - Net interest margin increased by 8 basis points in the fourth quarter and 1 basis point from the year-ago quarter. 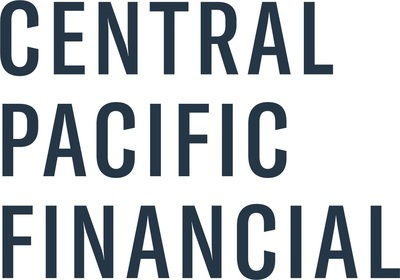 HONOLULU, Jan. 30, 2019 /PRNewswire/ -- Central Pacific Financial Corp. (NYSE: CPF), (the "Company"), today reported net income in the fourth quarter of 2018 of $15.8 million, or diluted earnings per share ("EPS") of $0.54, compared to net income in the fourth quarter of 2017 of $4.3 million, or EPS of $0.14, and net income in the third quarter of 2018 of $15.2 million, or EPS of $0.52. Net income in the fourth quarter of 2017 included an estimated one-time, non-cash charge to income tax expense of $7.4 million, representing a $0.25 decrease in EPS, due to the revaluation of the Company's net deferred tax assets ("DTA") resulting from the reduction in the corporate Federal income tax rate in connection with the enactment of H.R.1, commonly referred to as the Tax Cuts and Jobs Act ("Tax Reform"). Net income for the year ended December 31, 2018 totaled $59.5 million, or diluted EPS of $2.01, compared to net income for the year ended December 31, 2017 of $41.2 million, or EPS of $1.34. "We had a strong end to the year with significant loan growth and both ROA and ROE improvements. We plan to carry this momentum into 2019 as we drive forward our strategic initiatives to continue to enhance shareholder value." said Paul Yonamine, Chairman and Chief Executive Officer. "Strong loan growth has been a consistent driver of our performance throughout the year while our asset quality remained strong. Our solid financial performance in 2018 is reflective of the excellent team effort and dedication from our employees." said Catherine Ngo, President. In January 2019, the Company's Board of Directors declared a quarterly cash dividend of $0.21 per share on its outstanding common shares. The dividend will be payable on March 15, 2019 to shareholders of record at the close of business on February 28, 2019. During the fourth quarter of 2018, the Company repurchased 305,867 shares of common stock, at a total cost of $8.1 million, or an average cost per share of $26.35. During the year ended December 31, 2018, the Company repurchased 1,155,157 shares of common stock, or approximately 3.8% of its common stock outstanding as of December 31, 2017. Total cost of the shares repurchased during the year ended December 31, 2018 was $32.8 million, or an average cost per share of $28.42. The Company's remaining repurchase authority under its common stock repurchase program at December 31, 2018 is $20.7 million. During the year ended December 31, 2018, the Company returned $57.0 million in capital to its shareholders through cash dividends and share repurchases. Net interest income for the fourth quarter of 2018 was $44.7 million, compared to $42.8 million in the year-ago quarter and $43.3 million in the previous quarter. Net interest margin for the fourth quarter of 2018 was 3.28%, compared to 3.27% in the year-ago quarter and 3.20% in the previous quarter. The increases in net interest income and net interest margin from the year-ago and sequential quarters were primarily due to growth in the loan portfolio, combined with increases in the yields earned on the loan and investment securities portfolios. In addition, the Company received $0.5 million in interest recoveries on nonaccrual loans during the current and year-ago quarters, compared to $0.2 million in the previous quarter. These increases were partially offset by higher deposit and borrowing costs from the year-ago period, primarily attributable to the recent increases in the federal funds rate. Rates paid on total interest-bearing deposits remained relatively flat from the previous quarter. To improve net interest income and net interest margin, on December 17, 2018 and January 7, 2019, the Company redeemed in whole and at par, $20 million on each date (for an aggregate of $40 million) of floating rate trust preferred securities and the underlying floating rate junior subordinated debentures. The subordinated debentures were reported as long-term debt on the Company's balance sheet with a weighted average interest rate of 5.24%. After the redemptions, the Company has a total of $50 million of floating rate trust preferred securities and underlying floating rate junior subordinated debentures remaining, reported as long-term debt with a current weighted average interest rate of 5.01%. Other operating income for the fourth quarter of 2018 totaled $9.4 million, compared to $9.0 million in the year-ago quarter and $10.8 million in the previous quarter. The increase from the year-ago quarter was primarily due to higher commissions and fees on investment services of $0.6 million (included in other service charges and fees) and lower amortization of mortgage servicing rights of $0.3 million (included in mortgage banking income). These increases were partially offset by a loss on sale of investment securities of $0.3 million in the current quarter, combined with a gain on sale of investment securities of $0.2 million in the year ago quarter, and lower income from bank-owned life insurance of $0.4 million. The sequential quarter decrease was primarily due to lower income from bank-owned life insurance of $0.8 million, lower income recovered on nonaccrual loans previously charged-off of $0.3 million (included in other), and the aforementioned loss on sale of investment securities of $0.3 million recorded during the quarter. The lower income from bank-owned life insurance was primarily attributable to the decline in the stock market during the fourth quarter, combined with death benefit income of $0.4 million recorded in the previous quarter. Other operating expense for the fourth quarter of 2018 totaled $33.6 million, which decreased from $34.4 million in the year-ago quarter and decreased from $34.0 million in the previous quarter. The decrease from the year-ago and sequential quarters were primarily due to lower amortization of core deposit premium of $0.7 million as the intangible asset was fully amortized as of last quarter-end, or September 30, 2018. In addition, the Company recorded a net credit to the reserves for residential mortgage repurchase losses and unfunded loan commitments totaling $0.6 million (included in other) in the current quarter, compared to a net increase to the reserves totaling $0.1 million and $0.3 million (included in other) in the year-ago and previous quarters, respectively. The efficiency ratio for the fourth quarter of 2018 was 62.21%, compared to 66.32% in the year-ago quarter and 62.84% in the previous quarter. The improvements in the efficiency ratio from the year-ago and sequential quarters were primarily due to the aforementioned improvements in net interest income and other operating expense. In the fourth quarter of 2018, the Company recorded income tax expense of $6.0 million, compared to $13.4 million in the year-ago quarter and $5.0 million in the previous quarter. The effective tax rate for the fourth quarter of 2018 was 27.6%, compared to 75.7% in the year-ago quarter and 24.7% in the previous quarter. As previously discussed, income tax expense and effective tax rate in the fourth quarter of 2017 was impacted by the enactment of Tax Reform. Total assets at December 31, 2018 of $5.81 billion increased by $183.3 million, or 3.3% from December 31, 2017, and increased by $78.4 million, or 1.4% from September 30, 2018. Total loans and leases at December 31, 2018 of $4.08 billion increased by $307.8 million, or 8.2% and $100.3 million, or 2.5% from December 31, 2017 and September 30, 2018, respectively. The increase in total loans and leases from December 31, 2017 was primarily attributable to strong organic growth in the Hawaii loan portfolios totaling $274.3 million, combined with a net increase in the U.S. mainland loan portfolios totaling $33.7 million. The increase in total loans and leases from the third quarter of 2018 was primarily due to strong organic growth in the Hawaii loan portfolios (excluding the Hawaii construction loan portfolio) totaling $88.3 million, combined with a net increase in the U.S. mainland loan portfolios totaling $13.6 million. Total deposits at December 31, 2018 of $4.95 billion decreased by $9.9 million, or 0.2% from December 31, 2017, and decreased by $57.2 million, or 1.1% from September 30, 2018. The year-over-year and sequential quarter declines in total deposits were primarily attributable to decreases in government time deposits of $55.8 million and $65.1 million, respectively. Core deposits, which include demand deposits, savings and money market deposits, and time deposits less than $100,000, totaled $4.02 billion at December 31, 2018. This represents an increase of $24.7 million, or 0.6% from December 31, 2017, and remained relatively unchanged from September 30, 2018. The Company's loan-to-deposit ratio was 82.5% at December 31, 2018, compared to 76.1% at December 31, 2017 and 79.5% at September 30, 2018. During the quarter, short-term and long-term Federal Home Loan Bank borrowings increased to replace government time deposits and fund loan growth. Nonperforming assets at December 31, 2018 totaled $2.7 million, or 0.05% of total assets, compared to $3.6 million, or 0.06% of total assets at December 31, 2017, and $3.0 million, or 0.05% of total assets at September 30, 2018. Loans delinquent for 90 days or more still accruing interest totaled $0.5 million at December 31, 2018, compared to $0.6 million and $0.3 million at December 31, 2017 and September 30, 2018, respectively. Net recoveries in the fourth quarter of 2018 totaled $2.5 million, compared to net charge-offs of $1.0 million in the year-ago quarter, and net charge-offs of $1.3 million in the previous quarter. Net recoveries in the fourth quarter of 2018 included a $4.5 million recovery on a U.S. mainland land loan. In the fourth quarter of 2018, the Company recorded a credit to the provision for loan and lease losses of $1.4 million, compared to a credit of $0.2 million in the year-ago quarter and a credit of $0.1 million in the previous quarter. The aforementioned $4.5 million recovery contributed to the credit to the provision for loan and lease losses in the current quarter. The allowance for loan and lease losses, as a percentage of total loans and leases at December 31, 2018 was 1.17%, compared to 1.33% at December 31, 2017 and 1.18% at September 30, 2018. Total shareholders' equity was $491.7 million at December 31, 2018, compared to $500.0 million and $478.2 million at December 31, 2017 and September 30, 2018, respectively. The Company maintained its strong capital position and its capital ratios continue to exceed the levels required to be considered a "well-capitalized" institution for regulatory purposes under Basel III. At December 31, 2018, the Company's leverage capital, tier 1 risk-based capital, total risk-based capital, and common equity tier 1 ratios were 9.9%, 13.5%, 14.7%, and 11.9%, respectively, compared to 10.3%, 14.2%, 15.4%, and 12.0%, respectively, at September 30, 2018. The decline in the ratios was primarily due to the aforementioned redemption of $20 million in floating rate trust preferred securities and the underlying floating rate junior subordinated debentures which was treated as capital. This press release contains certain references to financial measures that have been adjusted to exclude certain expenses and other specified items. These financial measures differ from comparable measures calculated and presented in accordance with accounting principles generally accepted in the United States of America ("GAAP") in that they exclude unusual or non-recurring charges, losses, credits or gains. This press release identifies the specific items excluded from the comparable GAAP financial measure in the calculation of each non-GAAP financial measure. Management believes that financial presentations excluding the impact of these items provide useful supplemental information that is important to a proper understanding of the Company's core business results by investors. These presentations should not be viewed as a substitute for results determined in accordance with GAAP, nor are they necessarily comparable to non-GAAP financial measures presented by other companies. The Company's management will host a conference call today at 1:00 p.m. Eastern Time (8:00 a.m. Hawaii Time) to discuss the quarterly results. Individuals are encouraged to listen to the live webcast of the presentation by visiting the investor relations page of the Company's website at http://ir.centralpacificbank.com. Alternatively, investors may participate in the live call by dialing 1-877-505-7644. A playback of the call will be available through March 2, 2019 by dialing 1-877-344-7529 (passcode: 10127971) and on the Company's website. Central Pacific Financial Corp. is a Hawaii-based bank holding company with approximately $5.8 billion in assets. Central Pacific Bank, its primary subsidiary, operates 35 branches and 78 ATMs in the state of Hawaii, as of December 31, 2018. For additional information, please visit the Company's website at http://www.centralpacificbank.com. This document may contain forward-looking statements concerning projections of revenues, income/loss, earnings/loss per share, capital expenditures, dividends, capital structure, or other financial items, plans and objectives of management for future operations, future economic performance, or any of the assumptions underlying or relating to any of the foregoing. Forward-looking statements can be identified by the fact that they do not relate strictly to historical or current facts, and may include the words "believes," "plans," "expects," "anticipates," "forecasts," "intends," "hopes," "should," "estimates," or words of similar meaning. While the Company believes that our forward-looking statements and the assumptions underlying them are reasonably based, such statements and assumptions are by their nature subject to risks and uncertainties, and thus could later prove to be inaccurate or incorrect. Accordingly, actual results could materially differ from projections for a variety of reasons, to include, but not limited to: the effect of, and our failure to comply with any regulatory orders or actions we are or may become subject to; oversupply of inventory and adverse conditions in the Hawaii and California real estate markets and any weakness in the construction industry; adverse changes in the financial performance and/or condition of our borrowers and, as a result, increased loan delinquency rates, deterioration in asset quality, and losses in our loan portfolio; the impact of local, national, and international economies and events (including political events, acts of war or terrorism, natural disasters such as wildfires, volcanoes, tsunamis and earthquakes) on the Company's business and operations and on tourism, the military and other major industries operating within the Hawaii market and any other markets in which the Company does business; deterioration or malaise in economic conditions, including destabilizing factors in the financial industry and deterioration of the real estate market, as well as the impact from any declining levels of consumer and business confidence in the state of the economy in general and in financial institutions in particular; the impact of regulatory action on the Company and Central Pacific Bank and legislation affecting the financial services industry; failure to maintain effective internal control over financial reporting or disclosure controls and procedures; changes in estimates of future reserve requirements based upon the periodic review thereof under relevant regulatory and accounting requirements; the impact of the Dodd-Frank Wall Street Reform and Consumer Protection Act, other regulatory reform, and any related rules and regulations on our business operations and competitiveness; the costs and effects of legal and regulatory developments, including legal proceedings or regulatory or other governmental inquiries and proceedings and the resolution thereof, and the results of regulatory examinations or reviews; the effects of the Tax Cuts and Jobs Act; the effects of and changes in trade, monetary and fiscal policies and laws, including the interest rate policies of the Board of Governors of the Federal Reserve System; inflation, interest rate, securities market and monetary fluctuations; negative trends in our market capitalization and adverse changes in the price of the Company's common shares; changes in consumer spending, borrowings and savings habits; technological changes and developments; changes in the competitive environment among financial holding companies and other financial service providers, including fintech businesses; the effect of changes in accounting policies and practices, including changes as may be adopted by the regulatory agencies, as well as the Public Company Accounting Oversight Board, the Financial Accounting Standards Board and other accounting standard setters; changes in our capital position; our ability to attract and retain skilled directors, executives and employees; changes in our organization, compensation and benefit plans; and our success at managing the risks involved in any of the foregoing items. For further information on factors that could cause actual results to materially differ from projections, please see the Company's publicly available Securities and Exchange Commission filings, including the Company's Form 10-K and 10-K/A for the last fiscal year and, in particular, the discussion of "Risk Factors" set forth therein. The Company does not update any of its forward-looking statements except as required by law. Financial information for prior quarters has been revised to reflect the reclassification of amortization of investments in low-income housing tax credit (LIHTC) partnerships from total other operating expense to income tax expense, in connection with a change in accounting policy adopted in the fourth quarter of 2018 related to the Company's investments in LIHTC partnerships. ROA, ROE and ROTE are annualized based on a 30/360 day convention. Annualized net interest income and expense in the NIM calculation are based on the day count interest payment conventions at the interest-earning asset or interest-bearing liability level (i.e. 30/360, actual/actual). Efficiency ratio is defined as total operating expense divided by total revenue (net interest income and total other operating income). Dividend payout ratio is defined as dividends declared per share divided by diluted earnings per share. The tangible common equity ratio is a non-GAAP measure which should be read in conjunction with the Company's GAAP financial information. Comparison of our ratio with those of other companies may not be possible because other companies may calculate the ratio differently. See Reconciliation of Non-GAAP Financial Measures in Table 2. Financial information for prior quarters has been revised to reflect the impact of the adoption of ASU 2016-01, Financial Instruments - Overall (Subtopic 825-10): Recognition and Measurement of Financial Assets and Financial Liabilities. Financial information for prior quarters has been revised to reflect the reclassification of amortization of investments in LIHTC partnerships from total other operating expense to income tax expense, in connection with a change in accounting policy adopted in the fourth quarter of 2018 related to the Company's investments in LIHTC partnerships. Interest income and resultant yield information for tax-exempt investment securities is expressed on a taxable-equivalent basis using a federal statutory tax rate of 21% effective January 1, 2018 and 35% for all prior periods.